Cam's Cinematic Episodes: Film Review - THE INCREDIBLE HULK: Hulk? Smash! 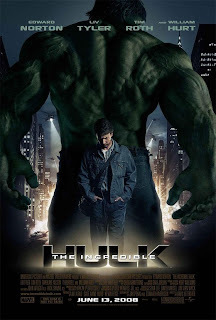 Film Review - THE INCREDIBLE HULK: Hulk? Smash! Remember all the hoopla that surrounded Marvel Comics’ Iron Man weeks, even months before its release? The endless magazine articles, trailers and Superbowl spots, coupled with feverishly optimistic predictions and speculation by nerds the world over? Well, while ol’ Iron Man was cake-walking into the warm glow of universal adulation and box-office triumph, the production of Marvel’s second major feature, The Incredible Hulk, was being met with a mix of scorn and pithy nay-saying. Including from yours’ truly. 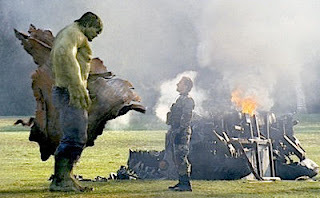 See I, like many, still feel the sting of 2003, when Ang Lee’s initial incarnation of the Hulk lurched awkwardly onto screens. A bloated and often depressing film that drow ned the great beast’s rage in a sea of pseudo-Freudian gobbledygook (Personified by a dishevelled and frenzied Nick Nolte); it was a major downer that seemed to act as a premature end to the Big Green’s film career. But it seems that the jolly folks of Marvel weren’t going to let little things like poor numbers and audience apathy get in the way of the franchising of one of their top comics properties (After Spider-Man and the X-Men), and to their credit they have successfully delivered one of the most joyously exhilarating spectacles of the season (thus far). The film opens with booming confidence, re-introducing the audience to the Hulk’s world through an electrifying opening credits sequence. On top of being a top-notch primer, it is also really effective visual storytelling. We are shown brief flashbacks of events that we’ve never actually seen, as this film has no connection to the previous film, yet which catches us immediately up to speed. Opening with a long, awe-inducing helicopter shot that follows an endless mass of poorly-con structed shacks up a Brazillian hillside, we are instantly immersed in the film’s world. It just so happens to be something of a lonely place, occupied by one very tired and tormented man named Bruce Banner. 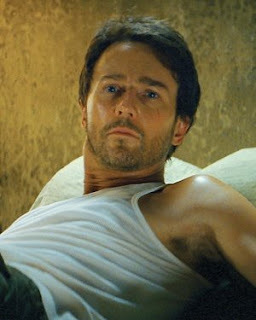 Played by Edward Norton, with the right level of gravitas, Banner is on the run from the U.S. Military forces overseen by the dogged General Ross (William Hurt), who wants to use his DNA for weapons experiments. Ross has hand-picked a team of top-agents, including a Russian British forces import named Emil Blonsky (Tim Roth). After Banner’s blood is inadvertently shipped back to the U.S. in a soda bottle (Don’t ask), the military killjoys track Banner down and we are treated to a kinetic chase through the rooftops and streets of Rio, a scene which owes more than a little to The Bourne Ultimatum. After an initial Hulk-out and escape, Banner heads back to America, where is aide d by his scientist sweetie, Dr. Betty Ross (Liv Tyler) – The General’s daughter. While the two search for a cure for Bruce’s spinach-coloured alter ego, Blonsky plays guinea pig for the General’s genetic enhancement experiments. As this is a comic-book, all does not go well and Blonsky eventually ends up horrifically Hulk-ified, leading to the film’s culmination: a spectacular Harlem-based throwdown between the two ginormous green-machines. Now I was dubious when press releases stated that Louis Leterrier, the mastermind behind The T ransporter (an overstylized piece of ADD junk), would be holding the Hulk’s reigns this go-around. Usually the better superhero flicks are produced by less action-oriented directors, but in this case Leterrier is an inspired choice. 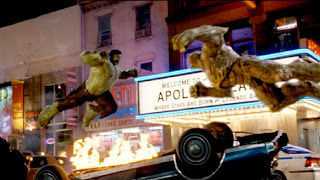 Since The Incredible Hulk is structured as a chase film, his energetic shooting style is perfectly employed in cranking up the tension and hitting all the necessary action beats. It’s a great looking picture that has a level of style and verve in its action scenes that wasn’t quite as obvious in the more wittily entertaining Iron Man. The actors are all perfectly cast, and play their roles well. Norton trumps Eric Bana’s bland Hulk ’03 performance, capturing the haggard torment and sharp intellect of Banner. He makes the dramatic scenes feel real and even when he disappears into a storm of pixels, his spirit remains present. Liv Tyler has somewhat of a thankless role, but manages to infuse Betty with a keen intelligence that complements her vulnerable beauty. Roth’s Blonsky is more interesting, a hubris-driven professional killer whose increasingly evident weaknesses and determination spell out his fate. Roth never goes too far, yet make s us almost feel bad for the guy when things start getting... ugly. In addition, Tim Blake Nelson has a wonderfully bizarre bit part as a biologist who just may have a solution for Banner’s problems. Hints that he may play a bigger role in future instalments filled me with geeky glee. Clocking in at a touch less than two hours, The Incredible Hulk perfectly encapsulates what a summer movie should be. It’s swift, funny and dramatically satisfying, with furiously thrilling effects and enough in-jokes to please any die-hard Marvel fan. This Hulk’s a smash!